I know a lot of people who get nervous at the very thought of cooking fish. When you poach salmon chances are it will come out being moist and staying in tact.. You can also make this ahaead of time because this dish would be great served cold. 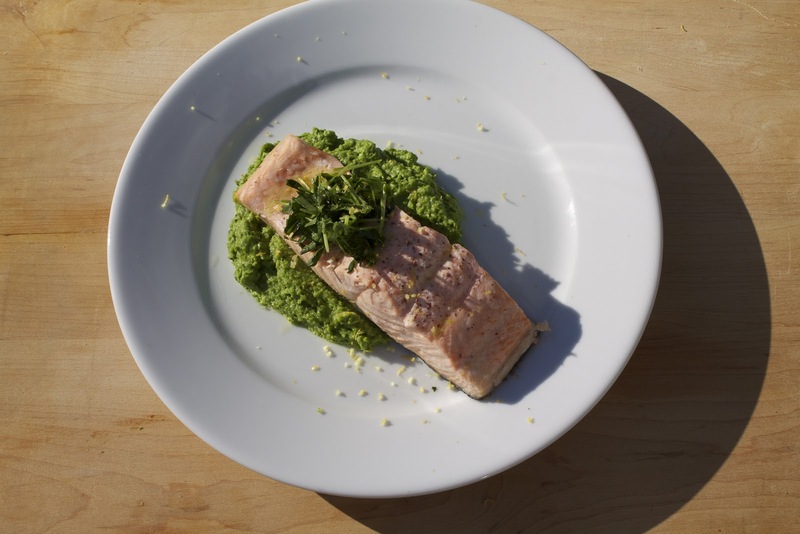 A traditional “yankee” (New England) dish was salmon and peas in spring and summer because it was local and fresh. This dish is an updated twist on that colonial classic. Place all of the ingredients for the court bouillon in a shallow sauté pan. Put it on medium heat and bring to a simmer for about 20 minutes. While the court bouillon is cooking make the peas! In a separate sauté pan add the shallot, 3 tbs. of olive oil and 1 tsp. butter and cook for about 2 minutes. Then add the peas, salt, red pepper flakes and black pepper to the shallots. Stir occasionally and cook for about 10 minutes or until tender over medium heat. Set aside to cool. Season the salmon with salt and gently add it to the court bouillon pan. Cover the pan and let the salmon poach for about 10 minutes (less if you like your salmon on the rarer side). Then turn off the heat and leave it in there for 2 minutes. Afterwards carefully return the salmon to a dish using spatulas and let it cool. In a food processor puree all of the ingredients for the pea puree together until it reaches a smooth consistency. Taste the puree (you may need to adjust the ingredients according to your taste). Set aside. In a bowl, mix together all of the ingredients for the salad. 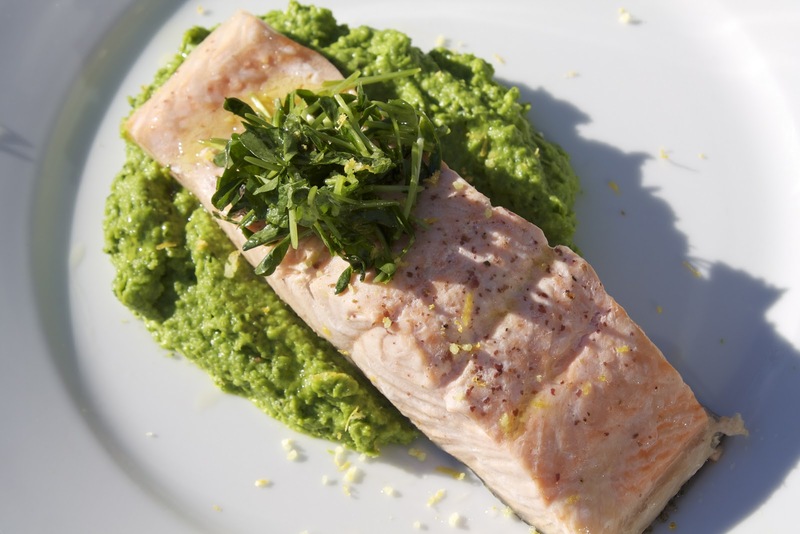 To serve place some of the pea puree on the bottom of a dish, then the salmon and the salad on top of the salmon. Sprinkle with some lemon zest.